Guy Fawkes Night, also known as Bonfire Night, is annually held to commemorate the 1605 failed Gunpowder Plot in which Guy Fawkes and his co-conspirators attempted to blow up Parliament with King James I inside. After the plot was felled and exposed, Fawkes and his group were arrested, imprisoned and executed. Though not a legal holiday, it’s observed throughout on November 5th – the original day of the plot. 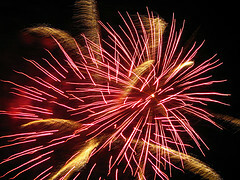 In observance, organized fireworks displays will light up the sky all weekend, November 2-5, 2007. The following celebrations are planned for Friday, the 2nd. Kingston Fireworks Display: 8 p.m., at Kingsmeadow Athletics Centre. There will also be fairground rides and other celebratory attractions. Admission: £5.00, children £3.00. Bishops Park Fireworks: 8 p.m. in West London; gates open at 6:30 p.m., there will be a children’s show too. Admission: £5.00 flat, for those 5 years and over. Streatham Fireworks: 7:25 p.m., this is one of three massive displays in South London. In addition to the fireworks, there will also be fair rides and fun for the entire family. Tube station: Streatham and Streatham Common. Brockwell Park Fireworks Display: 7:25 p.m.; get ready for an impressive display at this South London park, which is one of London’s biggest. Tube station: Clapham Common. *Bonfire Night, Wimbledone Park. Photo reprinted with permission of Mercer. Print article This entry was posted by Susan on August 30, 2007 at 9:31 pm, and is filed under Events in November. Follow any responses to this post through RSS 2.0. You can leave a response or trackback from your own site.